Aztec Products attracts admiration with a newly redesigned and redeveloped website by DDA. Aztec Products manufactures a wide range of floor cleaning and maintenance products that are designed to increase efficiency and effectiveness in cleaning operations. They wanted to improve their online image and presence on major search engines, so, knowing the quality they could expect demonstrated by their previous website, they came back to DDA for a complete redesign and redevelopment. In addition to information on each element of their product line, the website would also include an SEO menu of landing pages that would target important industry-relevant keywords that were actually used to find companies and information about the various floor cleaning and maintenance solutions they have on offer. The website would continue to have a variety of different forms to facilitate communications with clients, and would also have a financing calculator to help customers gain a better understanding of their purchasing options. A News blog would be built so that Aztec could continually add content with information that would be useful to their target audience. Their YouTube video catalog would be embedded into the website to demonstrate their products in action, and there would be sections of the site devoted to an image gallery and customer testimonials. DDA took the client's initial input into industry-relevant terms and conducted thorough keyword research to identify the strings actually used on major search engines to find information on the various topics at hand. From this, a content development plan and corresponding wireframe were established to map out how all the sections would be organized and how keywords would be best deployed for maximum search engine marketing impact. A large central image rotation was established on the homepage which featured some of the most important products in Aztec's product line and short accompanying marketing messages, with corresponding rotation of menu selections set to the right. Multiple forms were built out to help users contact Aztec for additional information on their products, to register a warrantee on their product, to add a customer testimonial, to return a product, or to simply facilitate general inquiries. Big, bold menu choices allowed users to quickly find comprehensive information on each item in the Aztec catalog, with each menu selection featuring an image preview and some brief marketing copy summarizing the given design. Side menus on each product page allowed users to quickly access brochures, manuals, parts details, FAQs, and a form to inquire for more information. Social media buttons were featured prominently at the top, and a financing calculator from their financing partner was incorporated. DDA took all the News items that existed on the old site and added these to an updatable blog that would facilitate content additions into the future. Then an animated version of their new logo was developed which featured a spinning pattern on the final C with rotating scrubbers that accurately portrayed the action of one of their propane burnishers. DDA also added an animated icon which rotated through a series of green cleaning facts designed to highlight the actual advantages that propane-powered burnishers can have relative to their electric counterparts. DDA continues to develop the website with additional features added on an ongoing basis. 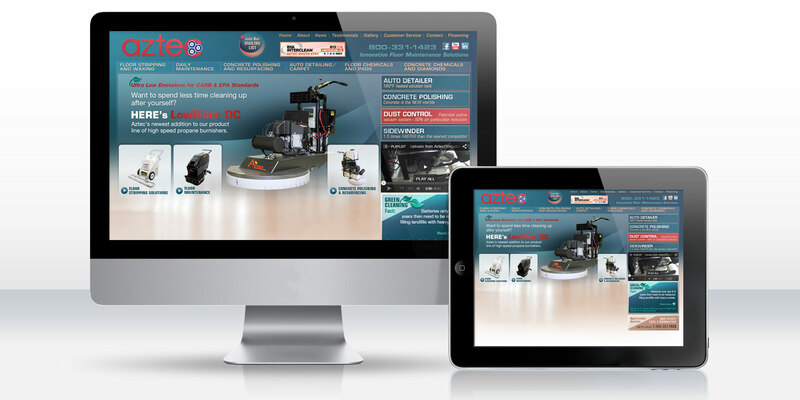 Aztec featured the newly redesigned website as a core part of their marketing efforts during the November '13 trade shows. They received a lot of positive initial feedback during that time and have been happy to add additional elements over time to increase user engagement even further. The original design, comprehensive information, numerous forms and tools, and strong search engine marketing presence all help to establish Aztec as a leader in their industry.